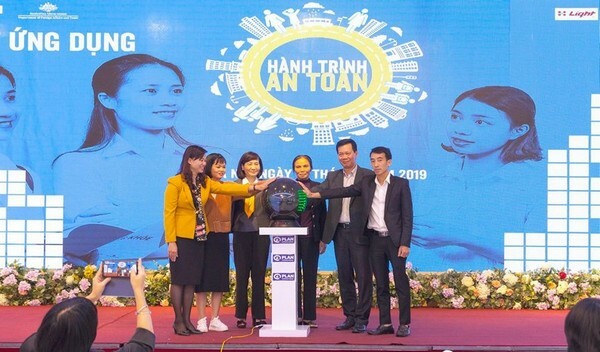 January 15, a launching event, introducing the 'Safe journey' mobbile app that connects female migrants to housing, job and other useful information, was held in Hanoi. Plan International Vietnam, along with LIGHT Vietnam, Dong Anh District Women’s Union and School of Economics and Engineering Bac Thang Long has developed a mobile application called ‘Hanh trinh an toan’ (Safe journey), which belongs to the project 'Empowering Female Migrant Youth to Succeed in the City and Workplace' (SAFE). The application connects housing, job opportunities and other helpful information about life in the city for people working away from home, especially female migrants. Over 20,000 female migrants in Dong Anh district, Hanoi will lose their jobs at the Industrial Zone once they turn 30, without stability or security in their future. Empowering female migrant youth to succeed in the city and workplace (SAFE) project by Plan International Vietnam and local partners will help resolve this, by providing female migrants (age 18-30) with opportunities in vocational and life skill training, access to health care services, safety housing, decent work and entrepreneurship, in order to acquire a more secured life with stable jobs./.